In 2018, the Congupna Tallygaroopna Landcare Group successfully completed the Tallygaroopna Station Park Regeneration project. 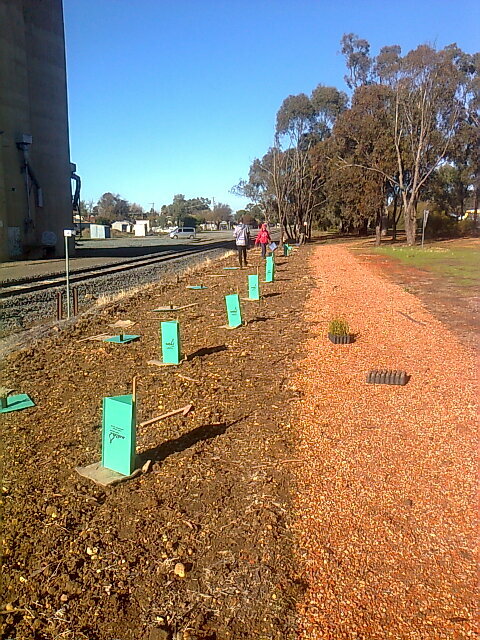 The project involved eradicating weeds, planting indigenous species, constructing a walking path and installing signage at Station Park. Involving the wider community in the project has provided educational opportunities to promote the benefits of providing habitat for local wildlife. The removal of priority weeds by a contractor allowed for the Landcare group to organise community planting days to revegetate the site. Advice was sought from local council to ensure that the correct plant species where installed at the site. Mulch was spread to control weeds and retain moisture in the soil. Landcare Australia assisted the Congupna Tallygaroopna Landcare Group to consult with the Yorta Yorta Nation Aboriginal Corporation, to ensure that the Yorta Yorta language was acknowledged onsite signage. This successful engagement has allowed for a greater connection between the two groups, with plans to work together in the future. The funding provided by VicTrack has allowed the group to improve their Station Park site. The group has volunteered to continue maintaining the site by watering plants and weeding, when needed, but have not requested ongoing funding to achieve these maintenance activities.